The Affenpinscher originated in Germany, where a number of different dog breeds were crossed into small, wiry, shaggy-haired dogs. The precursors to the Affenpinscher were specifically used for ratting on German farmsteads. The distinct breed today recognized as the Affenpinscher emerged around 1600. These original Affenpinschers were generally larger than the dogs we see today, but still retained their trademark shaggy hair and general demeanor. Affenpinschers are a bold, energetic dog that condenses the outlook and confidence of larger breeds within their small body. Affenpinschers can be a joy to own, as they are a confident and playful breed that takes on life with an unflappable demeanor. Affenpinschers are an intelligent breed that are quick to learn, and can easily master basic commands and new tricks. For this reason, Affenpinschers are commonly seen in obedience competitions around the world. Affenpinschers can be difficult to train due to their high level of intelligence, which can lead to boredom and stubbornness. However, with a dedicated owner that demonstrates their role as pack leader, the Affenpinscher can be a wonderfully well-trained dog. Owners of an Affenpinscher should begin training and socialization early, which will result in a well-adjusted and friendly companion. The Affenpinscher is an energetic breed that requires daily walks and vigorous play sessions in order to keep them entertained, well-behaved, and at a peak level of health. Affenpinschers are a healthy small breed, that have an average lifespan of 10-14 years. The Affenpinscher is one of the less popular AKC registered breed, ranking 149th among all AKC breeds. However, don’t let this deceive you. Owners of Affenpinschers are passionate about the breed, and tout their positive qualities. Affenpinschers need to be fed a high protein, grain-free diet. Adult Affenpinschers weigh between 7-9 lbs., so expect to feed them between 1/3 to 2/3 cups dry food a day, divided into two meals. Look for a high-quality food source that consists of a good balance of proteins and healthy fats. Avoid foods that contain grain fillers such as soy, wheat, and corn as these can lead to health complications and allergies. Affenpinscher translates to “monkey-like terrier,” pointing towards their shaggy appearance and unique face. Affenpinschers have a wiry, terrier coat that sheds very little and is fairly easy to maintain. To maintain your Affenpinschers distinctive look, expect to brush him on a weekly basis. Regular coat grooming sessions will be necessary throughout the year to keep your dog’s coat trim and healthy. It is also recommended to brush his teeth multiple times a week, and regularly check his eyes and ears for any signs of infection. Are Affenpinschers Good with Kids? 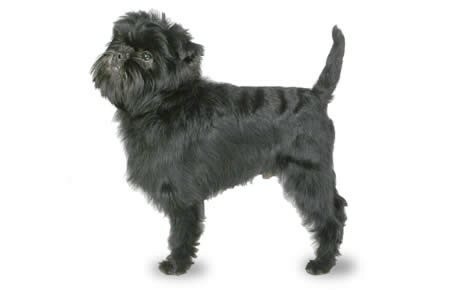 A well-trained Affenpinscher is a great family dog that is friendly, affectionate, and playful with children. The greatest danger is children who underestimate the size of the Affenpinscher, which can lead to inadvertent injury during play. Patellar luxation is a spontaneous dislocation of the kneecap. This condition occurs when the patella (kneecap) becomes dislocated during play or exercise. Affenpinschers are predisposed towards developing patellar luxation, so be aware if your dog exhibits signs of spontaneous lameness, limping, or shaking of a limb during play. This is a painful condition that warrants immediate medical attention. Hip dysplasia in dogs is a condition that occurs when the femur fits loosely into the pelvic girdle. In younger dogs, hip dysplasia presents innocuously as laxity in the hip assembly. Over time, however, this loose fit causes the cartilage in the joint to wear down, resulting in arthritis and bone spurs that can be very painful. Cataracts in dogs are a hereditary disease that affects many breeds, including the Affenpinscher. This condition occurs when the lens of the eye becomes opaque and cloudy over time. Cataracts usually begin to appear in adolescence, but continue to develop throughout the lifespan of the dog. Because cataracts are a hereditary disease, be sure to inquire with breeders whether there is any history of this disease in your pups line. The two most common types of canine heart disease affecting Affenpinschers are mitral valve disease (MVD) and patent ductus arteriosus (PDA). MVD is a degenerative condition that is characterized by a weakness in the mitral valve. A weakness of this valve results in blood flowing backward from the ventricles of the heart. This presents as a minor heart murmur, that can progress over time to become more serious. PDA is a congenital condition that allows blood to flow backward into the lungs. PDA is usually diagnosed during regular examinations by a veterinarian. If left untreated, PDA will most often result in heart failure at a young age. PDA is treated through different surgical means, depending on the severity of the irregularity. The vet recommended Canna-pet and now Indy’s back to following us up and down the stairs and taking long walks.